Telemachus: Big Bird: Show Us Your Financial Statements and Tax Returns, Big Fella! 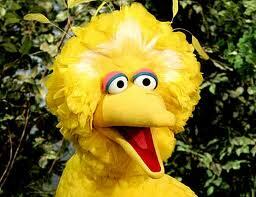 Big Bird: Show Us Your Financial Statements and Tax Returns, Big Fella! Has anyone seen the slightly amateurish ads lately by the Obama campaign that tries to hammer Governor Romney on 'cutting Big Bird' out of the federal budget? Probably not since even Big Bird and PBS has asked the Obama campaign to take them off the public airwaves. At a time when we have 23 million un/underemployed people in this nation, gas prices spiking like Billy Idol's peroxided hair and the Middle East completely coming apart at the seams, the geniuses behind the Obama Phenomenon of 2008 have resorted to a childish attack on Governor Romney on a serious issue such as budget discipline behind.....Big Bird? We love Big Bird just like all the other 'Sesame Street' characters such as Oscar the Grouch, Kermit the Frog and the Swedish Chef. Our personal favorite happens to be the Yip-Yip Aliens who never seemed to say much of anything except when they learned what a phone was or some other common household object. But PBS was founded at a time when there were only 3 major television networks in America: ABC. CBS, NBC. It was decided that America needed more intellectually stimulating programming than 'Three's Company' and 'Petticoat Junction', as entertaining as both of them could be. Today, with 2500 DISH channels and hundreds of basic cable channels available to the average consumer, it seems as if a station such as the Cartoon Network, The History Channel or the Discovery Channel would be more than willing to snap up 'Sesame Street' and make it part of their regular scheduled programming should PBS be disbanded and defunded by Congress. Their viewership would spike like the gas prices mentioned above. We actually love this debate because it fundamentally points out the difference between an expansive federal government getting into areas it probably should no longer be in and a smaller, less intrusive limited government that doesn't get into areas it doesn't belong in. Why should the average American taxpayer continue to pay his/her hard-earned money just so 73% of the PBS audience which is in the wealthier income brackets in this country can watch 'Big Bird', "Masterpiece Theatre' and the great John Cleese as Basil Fawlty in 'Fawlty Towers'? 73% of the people who watch PBS have household incomes of over $75,000...hardly Programming for the People, is it? Forthwith below, please find some facts with which to make your decision about whether you want more federal government or less of it. Granted, the $444 million or so spent on PBS is a proverbial spit in the tobacco spittoon of federal budgeting each year. But hey! If you ain't gonna cut the little stuff out of the federal budget, how in the world are you ever gonna cut the big stuff out of the federal budget, huh? 2) "Why does PBS need federal funds? Did you know that Big Bird and his buddies on Sesame Street are worth more than Mitt Romney? How much are they worth? A whopping $400,000,000. Katherine Lauderdale, senior vice president and general counsel, $381,855. And while the actor who plays Big Bird (Carroll Spinney) doesn’t have a salary that puts him in the 1 percent, he’s not far off: Spinney makes $314,072. Roughly $8 million of that annual $444 million each year goes to these 18 people named above. Even Big Bird makes more money each year than perhaps the vast majority of people reading this article right now. And he didn't even get laid off during the last 4 years or had his hours of work cut back due to budget shortages!